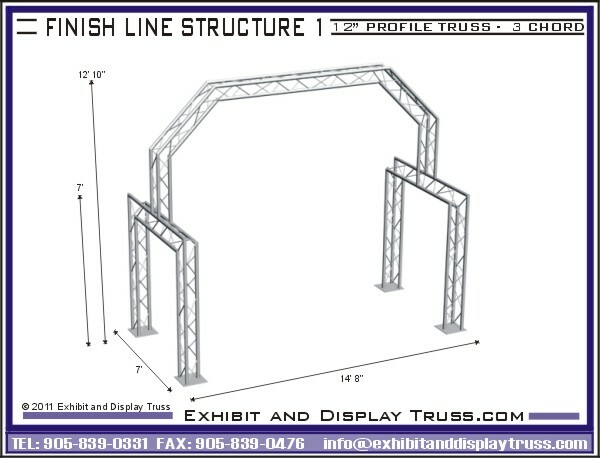 This truss structure was specifically designed as a finish line display for a running marathon, and remains a popular truss design choice among those looking for lightweight structures that are easy to assemble. When hung with banner displays, time clocks, and other race supplies, it serves as both a highly attractive and highly functional start or finish line stand for any marathon. Afterwards, it can be disassembled just as easily as it was set up, and packed away into a truss kit until the next time it's needed. Contact us today to design and create the perfect finish line or starting line aluminum truss system for your race event or marathon. We can help you select the right size truss and work with you and your team to provide you with an exciting, cost effective solution to your needs. We can walk you through the options and work with your dimensions to give you the most flexible, portable truss system on the market. Strong, durable, quick to setup and simply great value for your investment. We're happy to assist. 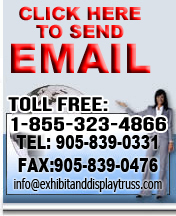 Give us a call and let us take it from there.